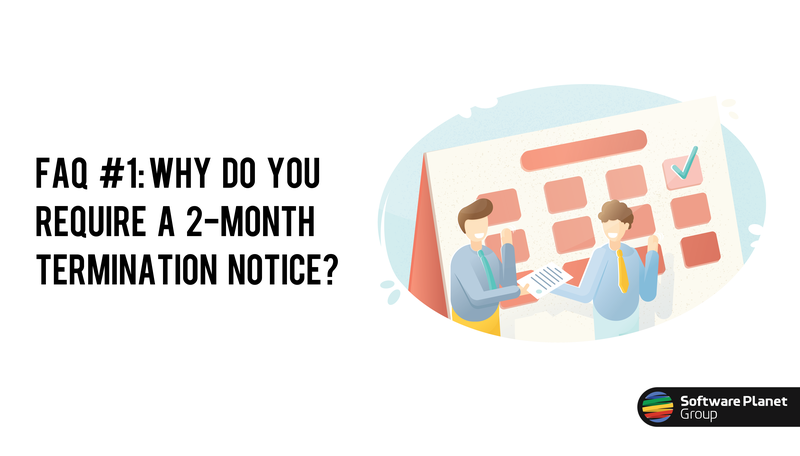 FAQ #1: Why Do You Require a 2-Month Termination Notice? Today, we are starting a brand new series of articles on some of the questions Software Planet Group are asked the most. Our hope is that these will someday serve to help you quickly refer to them in the future, should any queries arise. The first of these questions has to do with our 60-day termination clause — that is, if our customers no longer wish to work with us, then we ask that they provide us with no less than 2-months’ notice. Now, we know what you are thinking… two months does sound rather excessive, doesn’t it? And we get it, because if the tables were turned — initially, at least — we’d probably feel the same way. But you see, once you get into the nitty-gritty details of this process, you begin to realise that a two-month termination clause is actually beneficial to both us and our customers! Let us show you what we mean. Because we try to approach all our assignments as a project — by outlining your expectations and doing everything in our power (read: going above and beyond) to meet them — if our customers have any plans for future development, we would understandably like to know this in advance, as it enables us to plan ahead and deliver the best possible outcome. Ergo, much in the same way, it is also crucial to know if our customers have no further intentions of doing business with SPG, as this will allow us to take crucial steps towards preparing for the future of your projects. How would you feel, for example, if whoever were responsible for maintaining your application were forced to figure out the solution entirely for themselves, without any support at all from the original development team? Certainly not ecstatic! On the other hand, a two-month termination notice is ideal to provide our developers with just enough time to prepare those vital handover documents, such as diagrams displaying the structure of your solution, explanations on which services will be running and where, notes on which parts of the system are to be restarted in the unlikely event of an error, and so on and so forth. Essentially, however, any information which will be useful to you is planned and put together throughout this 2-month period — but could all of these documents be prepared and delivered overnight? Highly unlikely! While it is perfectly okay to not find yourself in a position in which you know a lot about your future plans, if that is the case, then we ask that you please let us know that as well. By noting the provisional nature of your project, we can make adjustments to our process and be as flexible and adaptable as you need us to be. And finally, being informed about your plans to carry on or not with development allows us to manage our resources with much greater efficiency, as you would likely not appreciate finding out that your hitherto faithful development team are now somewhere out in Tahiti, basking in the sunshine, at a time when you really believe they ought to be grafting on your pressing workflow management system. To summarise it all, our 2-month termination clause is all about thorough planning, as it provides SPG with the time we need to prepare for every eventuality, put together beneficial handover documents and effectively meet your expectations. So next time you hear about it, instead of gasping or spitting out your drink, you can simply smile and nod in total understanding.